There are always days when things go wrong; sometimes it starts small and spirals outwards other times the day just seems to blow up in my face right away. Some days homeschooling is not going well because LIFE is not going well... the washing machine is broken, the dish washer stopped working, the car won't start... you get the idea. 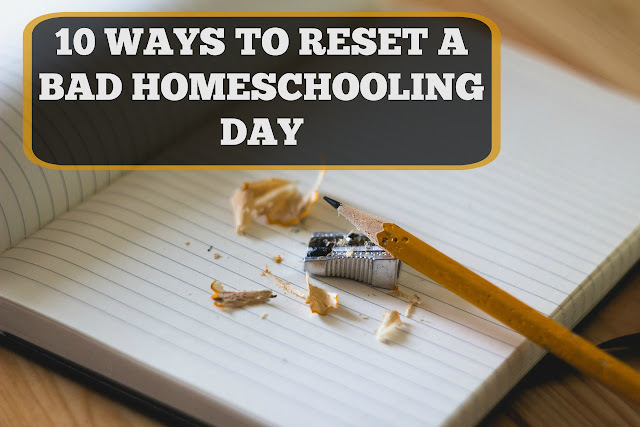 Some days homeschooling is not going well because it's homeschooling and the kids aren't getting along, or they don't want to do their work, or there's not much motivation to get things done. We all have them-- Bad Homeschooling Days! After three years we still have them, but I've learned a few strategies that help shorten them up and turn them around. 1. Put away the books! This was a hard lesson for me to learn but on days when homeschooling was not going well, when there were tears and fights I finally realized that pushing through the materials was a bit mistake. Now we pack away the books and don't even think of taking them back out until the next day. If it happens repeatedly over the same subject over the course of a few days or months we turn to new curriculum materials. 2. Get Out of the House! Whether we go out on a field trip, go out in the yard to play, or take a nature hike; getting outside usually helps us all recenter and let go of what was stressing us out. We've been known to do versions of this in winter too but it might involve sledding or painting snow instead. Just breathing in the fresh air and spreading out even for 30 minutes goes a long way to turning our day around. 3. Find a fun way to connect as a family. On those bad homeschooling days it can be difficult to remember WHY I chose to homeschool. Finding a fun activity to do together that will get us laughing and making positive memories helps to turn our day around. Something as simple as a trip to the store to buy some sundae supplies brings a smile to our faces and we laugh and bond as we make up our snacks and eat them. A silly string fight is another great/ cheap way to be silly and have fun together. 4. Get some space. Sometimes the only way to reset our day is to have everyone take some time to themselves. Winter often finds us at odds with one another after being cooped up together and when the bickering and fighting threaten to overwhelm our day I'll send everyone to their own rooms for an hour; they can read, play toys, build with Lego's and just enjoy peace and quiet time. Usually before the hour is up the boys are all playing together and getting along again. 5. Read a book. No matter how bad our day is going reading almost always works to calm everyone down. I usually pick a silly book to read aloud that will get us smiling and laughing. Sometimes we'll read snuggled up together in my big bed, in our pajamas with a bunch of blankets and pillows. 6. Meet up with friends or family. When our days are going bad there are few things that help as much as talking to someone who knows, who understands, who has been there... while I find that getting together with other people helps improve all of our moods, getting together with another homeschooling family helps mine the most. There is nothing like talking through our day and all the pitfalls with another homeschooling mom; even if it is an on-line conversation and not a face to face one. 7. Get Messy! I can often reset our day by pulling out some messy and fun materials; play- doh, shaving cream, a hands on science project or some painting usually can get our day turned around. 8. Play games. I'm the first to admit that this does not always work and it's one suggestion I make with a bit of caution. Whether or not playing games together will help turn our day around depends on why our day was heading south to begin with and what kind of game we're trying to play. If my boys are fighting and bickering and driving me nuts a board game is one of the last things I would attempt to do together because they inevitably lead to more arguing. But if our day is not going so well because we've been cooped up and the boys are antsy a game of Twister usually works wonders. If our day is not going well because the curriculum materials we chose for the day are not clicking a board game might be just the thing we need to cover the material in a new and fun way. Sometimes playing games helps turn our homeschooling day around. 9. Get active! Working out together using a workout video, going on a family bike ride, heading to a trampoline park or going roller skating is a great way to shake off our funk. Sometimes getting my boys out and active and tiring them our is the only way to calm a bad homeschooling day down. 10. Watch a movie. Sometimes when all else fails we can settle our day down with a movie. It might be something educational or just something fun but watching a movie, eating some popcorn and settling them all down can help turn our attitudes and our day around. These are some wonderful ideas :) So many times we're afraid to take time away from studies, when that's what we really need to do. In the long-run, more learning will happen! Thanks for linking up at Together on Tuesdays! Yep, that's definitely what I have learned too. These are great tips. The thing is, there is something to learn even when doing any one of these things. We kill our days by insisting we stick to the books even though we know it isn't working! Absolutely! That is what we have learned... learning doesn't always come from books and it's just not worth plowing through them all if we're miserable. This is exactly what I was writing about today (day went south because we ALL have colds). Nice to know we're not alone. Great post. It's so often the case that the flaws are about life in general however we are educating - a lesson in itself! These are some great ideals!!! I have a very hard time changing my own attitude when things go bad. I envy those who, even after being upset, easily move past it. This is not easy for me and something that I really need to work on. Putting the books away is hard for me, but I have seen the benefits of doing this! Thank you for so many awesome ideas!!!! Oh me too! I was so stubborn in turning our bad days around too. In the beginning I resented it when the boys attitudes or unwillingness to work ruined our days and I felt like putting away the books was rewarding them for bad behavior... I also think I secretly thought they deserved the punishment of continuing on but I soon learned that it made the days more painful and that if I was going to succeed at this homeschooling thing we had to enjoy it! We had to find as much enjoyment as we could as often as we could and that make the work part bearable and actually made them more willing to learn and work hard. 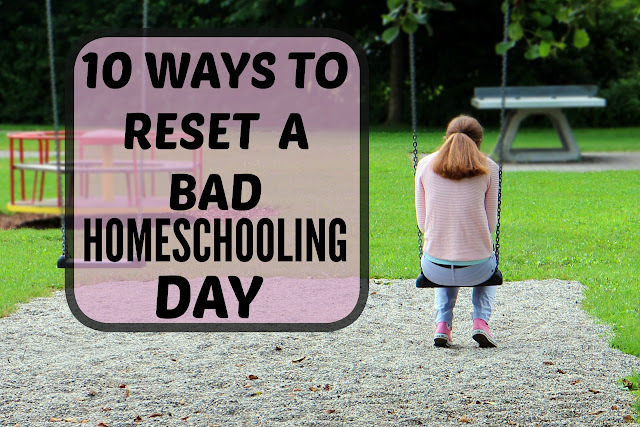 Homeschoolers need this list of tools handy for those bad days! Especially, when we're not always thinking clearly in the moment...ummm aggravation. Lol! I completely agree with your comment about feeling like putting away the books was rewarding bad behavior. They need to learn to push through. That way of thinking and pushing is why a homeschool mission statement is so important. I want my daughter to love learning! More than I want her to finish her work on time. I have to remind myself of that all the time! Putting away lessons and cuddeling up with a good book is usually works well with us. :) Than you for sharing with us on Live Life Well. Yes, I want my boys to love learning more than I want to finish the lesson too. It's not always easy to remember that in the moment. I felt like our first year or so of homeschooling it was so easy to turn our bad days into a battle of wills but I soon found that redirecting all of our attentions worked so much better.